Playing with my tiny slow cooker is much like Forrest Gump’s box of chocolates. You never know what you are going to get. Yes, it’s definitely the surprises that keep me coming back. 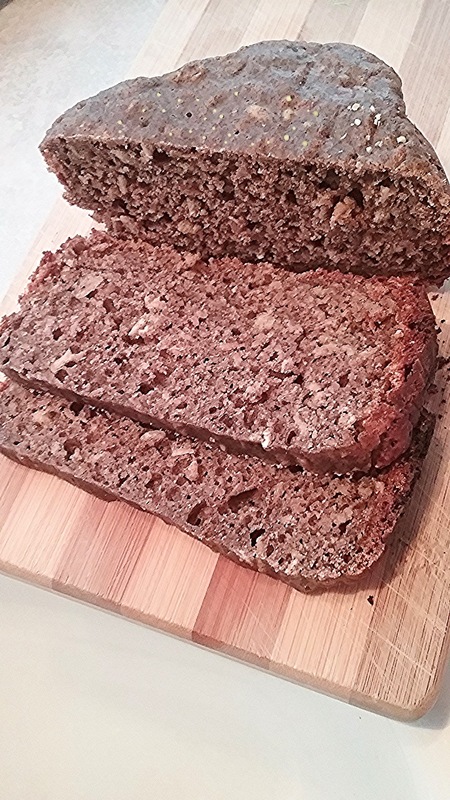 If you are a fan of the English muffin loaf style of bread or New England brown bread, then take a look at this chewy, highly nutritious, richly flavored brown bread. Did I mention easy? Its unusual approach begins by soaking rolled oats in yogurt for several hours. Once the baking soda and flour mixture is combined with the yogurt mixture the batter goes wild. Random baby bubble emerge during the baking process to create a moist and fascinating texture. 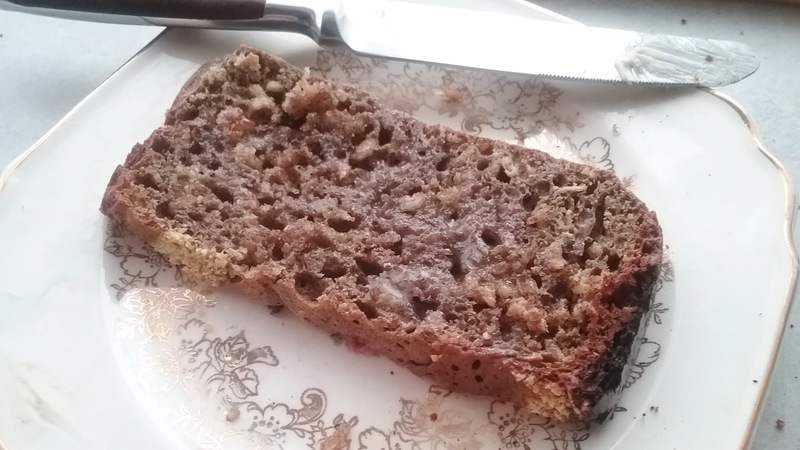 The brown bread element comes chiefly from a hint of buckwheat flour. I keep a small stash on hand for its dark robust characteristics that make everything taste better—from noodles to crepes and breads. Of course, whole wheat or rye flour will work, too. An addition of egg helps to stabilize and provide a hint of richness to a seemingly bland composition. There’s enough sweetness from the brown sugar to tie it all the together, admirably offset the tang of the yogurt, and complement the oats, buckwheat, and whole wheat flours. Once ingredients are combined, the results are somewhere between a dough and a batter: there is no shaping, just carefully spoon it into the pot. It may seem silly to be ‘baking’ in a crock pot, but I love the idea of using a mere 95 watts of power to create a substantial loaf in only two hours. Since this is not a firm dough, I butter my 2-quart crockery pot and run two folded strips of parchment crisscrossing in the bottom and up the sides to act as handles for lifting out the bread. A common problem with bread baking in the slow cooker is that the top does not brown. One solution is a quick toasting under the broiler, which seems at odds with the whole premise. Instead, for an inviting crunch here, I opt for a light dusting of grainy cornmeal in the bottom of the pot and a sprinkling across the top before baking. Combine yogurt, milk, and oats; cover and chill for 6 to 8 hours. In a mixing bowl combine egg, oil, and sugar with yogurt; blend and mix well. Combine the flours, baking soda, and salt and stir into the liquid. Preheat 2-quart crock pot set to high; butter the crockery liner and fit it with 2 strips of parchment crisscrossed and running up the sides. Dust the bottom with cornmeal. Pour batter into the crockery pot liner and sprinkle top lightly with cornmeal. Cover the top with 3 layers of paper towels tucked under the lid to absorb moisture. Bake for about 2 hours rotating liner every 30 minutes to brown evenly, until bread pulls away from sides and tester inserted in middle comes out clean. Lift out with parchment straps onto cooling rack. If it sticks, run a knife around edges. Let cool before slicing. Yield: 1 small loaf. 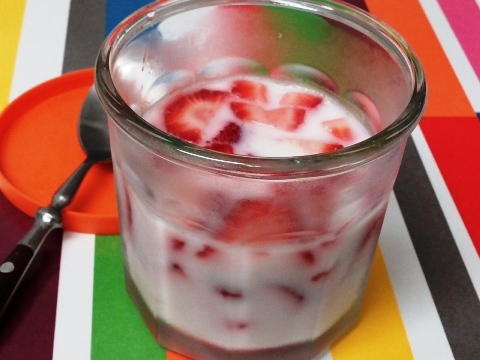 I wrote during the summer about tinkering with a light refreshing gelatin dessert (sans Jell-o) based on unflavored gelatin, fresh fruit, and fruit juice. In my earlier post, I referred to it as gelée, French for jelly (pronounced je-lay’), to get as far away from Jell-o as possible. Perhaps I’m kidding myself, but this method elevates gelatin desserts to a far more distinguished and healthful realm. Both flavor and texture are decidedly more delicate and of course, there’s less sugar, artificial color and flavoring. It didn’t end there, though. In the dairy case of my local grocery store I discovered a whole fleet of interesting ready- to-eat yogurt/gelatin snacks geared to the Latino market. At the time I didn’t have much freezer space and this looked like a good option to cooling ice cream and frozen yogurt. I became a regular at a nearby market stand known for their rotating supply of excellent fresh berries. We worked our way through raspberries, blackberries, marionberries, blueberries, and any other berry they could grow. I was happy. It was my way of maintaining an uninterrupted supply of incredible berries, all nicely suspended in a tasty, refreshing yogurt gelatin. As time went on, I hit on a fall back version that included an individual serving of flavored Greek yogurt and a complementary fruit juice. More often I would reach for some variation of coconut yogurt and the latest in an ever changing variety of coconut waters. I even discovered that sparkling coconut water works. About a month ago my work schedule changed and I got away from my yogurt gelée extravaganza. Today that was remedied when I spotted fresh strawberries at my grocery story, albeit not local. Here’s is my latest adult version, slightly sweetened, but better than any imagined Jell-o. Use this as a model, any moderately soft fresh fruit will work; vary the yogurt and fresh fruit juice to complement the fruit. 2-3 cups fresh strawberries, sliced or raspberries, blueberries, peaches, grapes, etc. Slice the strawberries into a bowl; if lacking flavor, sweetened to taste with about 1 Tbsp agave or sugar. Soften the gelatin in ¼ cup cold water for 1 minute. Add ¼ cup boiling water and stir to dissolve the granules completely. Add the cold yogurt, whisking until smooth. Stir in the cold juice. 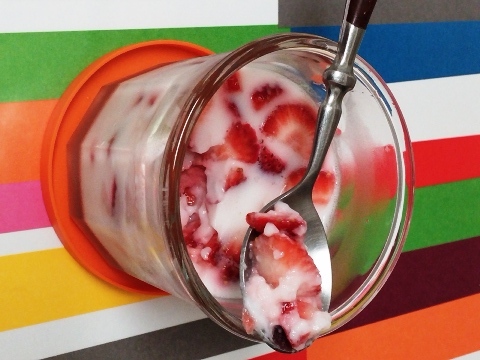 Place the berries evenly in four generous 1 cup containers with lids, or a 1-quart bowl. (If using a large bowl, place the berries in it in per step 1). Pour the cooled yogurt mixture over the fruit and stir lightly. Cover and chill until set, 3 to 4 hours. Serves 4.